This cake was made of chocolate cheese cake and chocolate sponge cake. I used freshcream topping. It took me 10 hours to complete it. This was my first 3D cake, I hope you all will enjoy it. Hey do you sell cakes? YOUR CAKE IS BEAUTIFUL. DID YOU USE THE WILTON BEAR CAKE PAN TO MAKE ELMO. how much do you charge for that cake? Alot of my friends asked the same question. Is the Elmo cake too? I have baked two 4" x 8" chocolate sponge cake a day before frosting. Then I cut into parts of the body. It was a challenging cake, actually I only started cake deco for about 2 years. I still have a lot to learn. Thanks for viewing. Your cake is just darling. 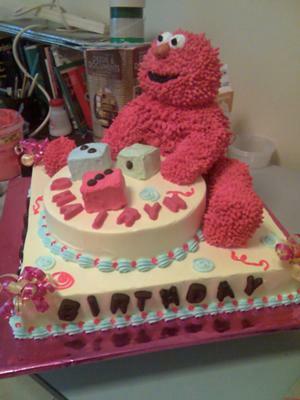 Is the elmo cake also? What a great job. You are surly a pro. Nancy from Cal. This cake is amazing. I can see how it took you ten hours to complete. All I can really say is WOW! The design is even very unique. Thanks for sharing! Join in and write your own page! It's easy to do. How? Simply click here to return to Elmo Birthday Cake.